Crews have begun work to construct the new sound wall along the northbound I-5 Florence Avenue on-ramp, adjacent to Longworth Avenue. Over the next two to three weeks, crews will continue drilling CIDH (cast in drilled hole) piles along northbound I-5. This operation will be conducted weekdays, between 6:30 a.m. and 3:30 p.m.
A portion of the sidewalk on Longworth Avenue, adjacent to the northbound I-5, has been closed to accommodate sound wall reconstruction. A chain link fence has been installed to close this area of the sidewalk from public access through the end of 2017. The sidewalk will be restored once sound wall construction is complete. Sunday, Sept. 10 through Thursday, Sept. 14, the contractor will be performing falsework operations nightly between 9 p.m. and 6 a.m. and will close southbound Pioneer Boulevard to traffic between Crewe Street and Imperial Highway. In addition, on Sunday, Sept. 10 through Thursday, Sept. 14, Imperial Highway will be closed nightly from 9 p.m. to 6 a.m., between Adoree Street and South Frontage Road, for shoring and drilling operations for CIDH (cast in drilled hole) piles. On Thursday, Sept. 14 from 9 p.m. to 7 a.m. Friday, Sept. 15, Imperial Highway will be closed between Adoree Street and South Frontage Road for concrete operations. Closure areas are shown in red on the map below; detour routes are highlighted in green. Unless otherwise noted, work will be performed between 9 p.m. and 6 a.m. This information can also be found on the project Google map. Pile driving activity along I-5 at Pioneer Boulevard and Imperial Highway will be completed this week. On Thursday, Sept. 14, crews will begin pile driving at Norwalk Boulevard / San Antonio Drive bridge; this work will be conducted weekdays between 7 a.m. and 3:30 p.m. and will be ongoing intermittently for the next few weeks. Please be advised this work may be loud and disruptive due to equipment noise, vibration, and pounding related to pile driving activity. As crews work on Imperial Highway, Norwalk Boulevard and Pioneer Boulevard bridges at I-5, one lane in each direction will be closed on each street (at I-5) during the daytime, between 8:30 a.m. and 3:30 p.m.
Beginning the week of Sept. 10, crews will close the northbound I-5 Norwalk Boulevard off-ramp, nightly, between 8 p.m. and 5 a.m., Mondays through Fridays, for approximately the next two weeks. Motorists will be directed to exit northbound I-5 at Carmenita Road, while this work is ongoing. 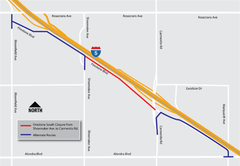 In addition on Wednesday night, Sept. 13 and Thursday night, Sept. 14, crews will close two lanes on northbound I-5 at Rosecrans Avenue, at night between 10 p.m. and 5 a.m.; at least one lane will remain open at all times. These closures are needed so crews can complete paving work along the new northbound lanes of I-5. Nightly closures are ongoing on Firestone Boulevard south, between Shoemaker Avenue and Carmenita Road (shown in red below), between 7 p.m. and 5 a.m., Mondays through Fridays; this work will be ongoing into October. The contractor will be performing nightly concrete pours throughout the project area and these closures are necessary to allow for construction vehicle staging and to maintain nightly access for the contractor to their concrete plant. Flaggers will be on site to maintain access for businesses within the closure area shown below in red. However there will be no through access along this portion of Firestone Boulevard south for the general public. Available alternate routes are highlighted on the map below in blue. Pile driving and shoring activities are ongoing on the south side of Valley View Avenue. This work will be conducted weekdays during the daytime between 7 a.m. and 3:30 p.m.
*DISCLAIMER: Due to the dynamic nature of construction, please note that all dates and times are subject to change due to unforeseen operational factors or inclement weather. For information regarding upcoming closures, detours and other construction activity, be sure to check out the project Google map. This map will be updated in real time, with the latest information regarding project construction. Click the image below to view the map.